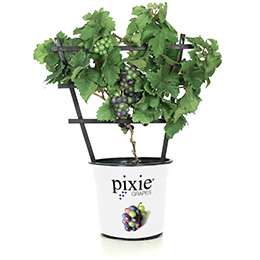 Pixie Grapes™ is the world’s first line of dwarf grapevines—a Plug Connection EXCLUSIVE. These small but precocious plants produce dozens of miniature grape clusters. Easy to maintain both indoors and out. Perfect for the urban patio vineyard! Greenhouse production recommended for 12 week finish.